Leopoldo Palacios, of Venezuela is a one of the most highly respected and sought after course designers in the world. He is known for his innovative and technically challenging but humane approach to course design. An FEI ‘O’ course designer Leopoldo has designed courses at the biggest and best venues the world over including the Olympics, WEF, the World Cup finals and the Spruce Meadows Masters. When he designed the courses at the 2000 Sydney Olympics and co-course designed the 2008 Olympic Games with Steve Stephens he became the second person in history to have had the distinction of designing the course at two Olympic Games. Leopoldo has also officiated at competitions in more than 35 countries including: Canada, the United States, Mexico, Guatemala, Costa Rica, Peru, Chile, Argentina, Ireland, Germany, Sweden, Belgium, Australia, New Zealand and Saudi Arabia to name but a few. Leopoldo was also the course designer at the 1997 World Cup Final in Gothenburg, Sweden, the 1991 and 1995 Pan American Games in Buenos Aires and Havana respectively. From the years 2005-2007 he acted as the Technical Delagate for the Beijing Olympics as well as for the 2003 Pan Am games in Santo Domingo, the 2004 Athens Olympic Games, the 2005 World Cup Final in Las Vegas and the 2007 Pan-Am games in Rio de Janeiro. A former competitor himself, Leopoldo competed nationally and internationally from 1956 until the 1980’s. In 1971 and 72, he was named Venezuela’s ‘Rider of the Year’. In 1976, he began working as a course designer and, in 1993, earned his Official International Course Designer status from the FEI, the highest level of achievement. Leopoldo was formerly the 2nd Vice President of the Fédération Equestre Internationale (The International Equestrian Federation). He is the co-founder of the Aachen School of Course Design, and is currently an ambassador for Just World International. Leopoldo can easily be recognized at any horse show by his signature crumpled, faded yellow hat. 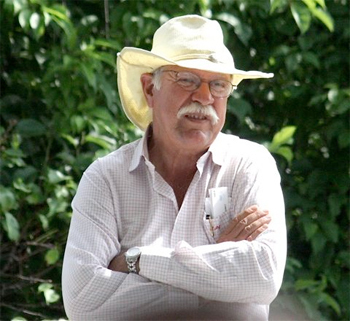 Leopoldo Palacios, world famous Olympic & World Cup Finals course designer, shares his insights and philosophies about the challenges he presents to horse & rider when creating his impressive courses. In Part One of this topic, Leopoldo and Bernie walk the course for the $35,000 Blenheim Summer II Grand Prix in San Juan Capistrano, California. You’ll see the course from the viewpoint of the designer, who’s goal is to fairly test the abilities of the competitors, while Bernie looks at the course from the rider’s perspective, assessing how to best negotiate each obstacle. To view Part Two of this topic including the opinions of several riders and special commentary from Leopoldo and Bernie click here. To view Part Three of this topic with World Cup & World Equestrian Games course designer, Olaf Petersen, click here. To view Part One of this topic click here.